[General description] Gawler Street, Mount Barker, looking west up the hill towards Auchendarroch, the summer residence of the Barr Smith family. Township buildings line the street in which cars are parked. 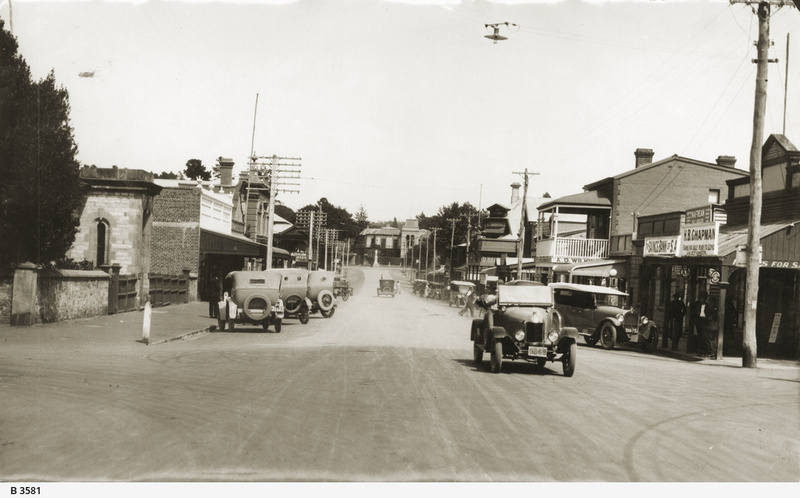 The car in the centre of the road was one of three registered to the Murray Aunger Motor Company in February 1918. A Dodge Tourer, parked on the right near the Savings Bank, was registered to J.G.H. Paech of Callington in June 1924. [On back of photograph] 'Reproduced in the Chronicle, Mar. 27, 1926 / Main street, Mt. Barker'.